In a previous post, we took a brief look at the System.Reflection.Assembly class. In this post, we are going to move down a level and take a look at the Type class. 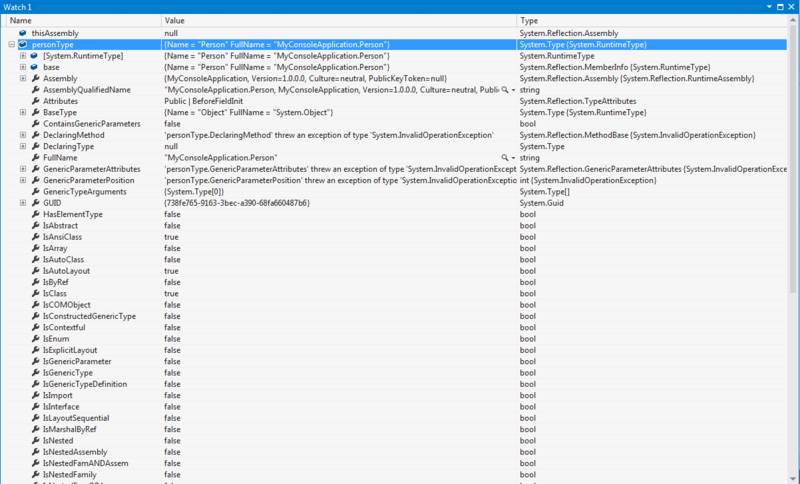 Every object that resides within a .NET application is a specific Type. Let’s go ahead and dive in to some code samples that allow us to work with types a little. In the previous post we created a very simple Visual Studio solution that contained a C# Class Library and a C# Console Application. In this post we will add a new class to the console application then from the Program class’s static Main() method we will instantiate our new object. We will work with our new class and add methods to perform certain tasks related to getting Type information. We will add a new class to the console application and we will name it ‘Person’. Since a person has qualities such as a name, age, height, weight, and so on, we will add a few properties to the class that we will then retrieve and work with via Reflection. There are more properties of the Type object than I can display in the illustration above but this is more than enough to get us started. If you scan through the property list, you will that there is a lot of information about the type available. Let’s talk about a few of the more important properties shown. First, look at the Assembly property. You can see that the value describes the ConsoleApplication assembly, including its version, culture information, public key token (which is null because the assembly is not strongly-named). Next, the AssemblyQualifiedName shows the same stuff, except the full namespace and type name of the Person object are prepended. The BaseType property describes the type from which the Person class inherits. In this case, it inherits from System.Object. Had our class inherited another class, the BaseType would reflect that type, and its BaseType would reflect its base type and so on. Ultimately, the lowest level base class would have a BaseType of System.Object. Make sense? All if the properties that start with Is* are Boolean values that indicate what their names describe. So far so good? Great! Let’s move on to some things that are a little more interesting. The Type class’s GetProperties() method allows us to retrieve all properties within a type. This method returns an array of PropertyInfo objects. The PropertyInfo type provides us access to the metadata of a property. Sound confusing? Let’s just dive into some code and clear it up! All of the properties that defined in our Person class are shown here with their data types (both short and full names) and with boolean values that indicate whether they are read-only or write-only properties. The presence of get and set accessors means that our properties are read and write properties. Pretty simple. Okay, this warrants some discussion. To set property values via Reflection, you must use the Type.GetProperty() method, then invoke the PropertyInfo.SetValue() method. The default overload that we used accepts the object in which to set the property value, the value itself, and an object array, which in our example is null. The MSDN resource here explains the overloads of the SetValue() method in more detail. Getting property values is pretty straightforward and easy using Reflection. In a similar manner to getting the properties within a type, getting and working with methods is pretty simple. For this sample, our methods do not contain generic arguments and I did this to keep the sample simple. We will cover invoking generically-typed methods in a later post. The following code gets all the methods within our Person type and writes information about each method to a StringBuilder. This is odd because we only defined two methods for our class, right? Well, it actually makes perfect sense because we retrieve ALL of the methods for the Person Type. Beginning from the top of the results list, take a look at the methods whose names begin with “get_” and “set_”. It just so happens that properties are implemented in MSIL as methods! The get accessor is actually a method with a name that begins with “get_” and the set accessor is a method that begins with “set_”. So in reality, each of our properties created two (2) methods. The ToString(), Equals(), GetHashCode(), and GetType() methods are actually inherited from the System.Object class which is the default base class of ALL objects in .NET. So if we eliminate these methods, we are left with our two public methods, SayHello() and Speak(). When dealing with non-generic methods, there are two basic ways to invoke them dynamically. The first approach is to get a reference to the MethodInfo object for the method to be called, then calling the MethodInfo.Invoke(object, object) method. With this approach, the first argument is the object within which the method is to be called. In our case the ‘person’ object. The second argument is an object array that accepts the arguments expected by the method in the order they are specified in the method. The second approach is to Type.InvokeMenber(methodName, Binder, object, object) method overload. I chose this overload of the InvokeMember method because it is the simplest and is perfect for illustrative purposes. So let’s get going with some code to test this out! Let’s stick with our iterative approach to loop through the methods as we did above, but lets add some code that checks to see if the method name is “Speak” or “SayHello”, then invoke the method using Approach #1 first. ***Calling the SayHello() method. The result of the method call is: Hello! ***Calling the Speak() method. The result of the method call is: How are you today? Pay attention to the lines in blue. We actually called those methods and added the results in a formatted way to our sample output StringBuilder. Pretty simple, right? So now we have looked at a couple of ways to invoke methods via Reflection. One method accepts no arguments and the other accepted a string. What if we had a method that accepted two or more arguments? The result of this method call is: Bobby, Gene it is time for dinner!. Within C#, a class can only inherit one base class (i.e. can only have one BaseType). A class can, however implement multiple interfaces. An interface looks much like a class, but only contains the definitions (signatures) of the public properties, methods, events, and indexers within the class that implements it. When discussing interfaces, we use the term “implements” for any class whose construction is governed by an interface. It is an accepted rule that interface names should generally begin with the letter “I”. Now that we’ve created our interface, let’s flip over to our Person class and implement the interface. This shows us that the IPerson interface is implemented by the Person type. If we expand the watch definition for the IPerson type we see all the properties for that that we saw for the Person class. The differences will be in the IsClass and IsInterface properties. Pretty simple. This entry was posted in .NET Development, Reflection and tagged .NET Reflection, AssemblyQualifiedName, C#, GetInterfaces, GetMethods, GetProperties, GetType, Invoke, MethodInfo.Invoke, PropertyInfo, PropertyInfo.GetValue, PropertyInfo.SetValue, SetValue, Type.GetInterfaces, Type.GetMethods, Type.GetProperties, Type.GetType.